Happy Friday, everyone!! 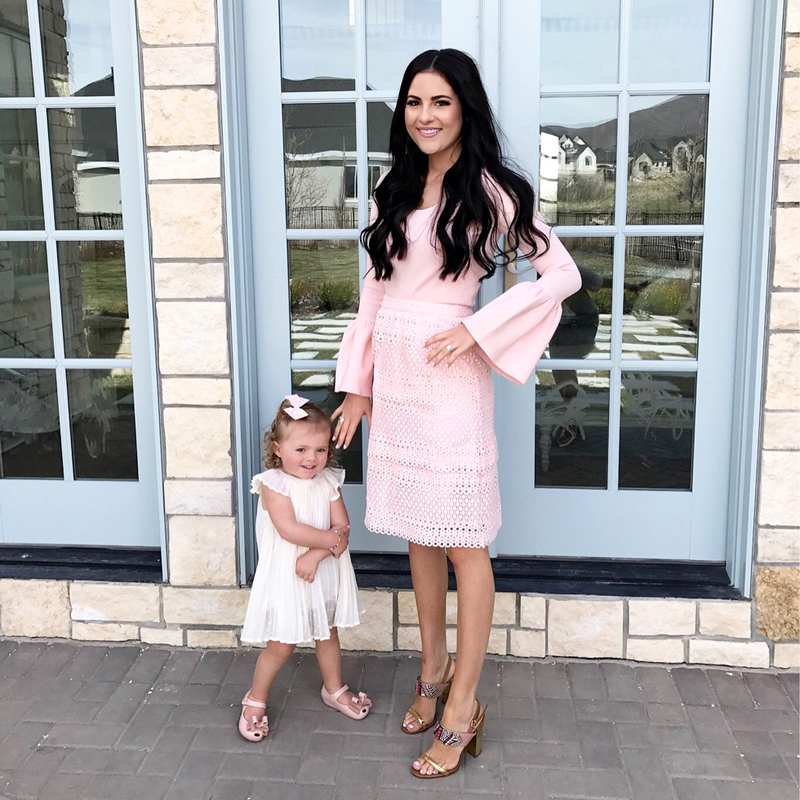 Today I thought I’d share with you a few of the latest looks I’ve posted on my Instagram (@rachparcell) since I had so many questions about where I got everything! I hope you all have an amazing weekend, thanks for stopping by! Don’t you have a “Shop My Instagram” page? Why does that never get updated? Every look is so you and so chic, my favorites are the ones with the ruffled sleeves!! Such great outfits, as always, Rach! I love the 3rd and last one especially, the pink mules look so good paired with the ruffled sweater! Thanks for sharing and I hope you have a great weekend ahead! These are all such great looks, can’t even choose a favorite! But I do really love that J Crew ruffle sweater! I do too!!! So perfect for spring! The first and the last looks are fantastic. 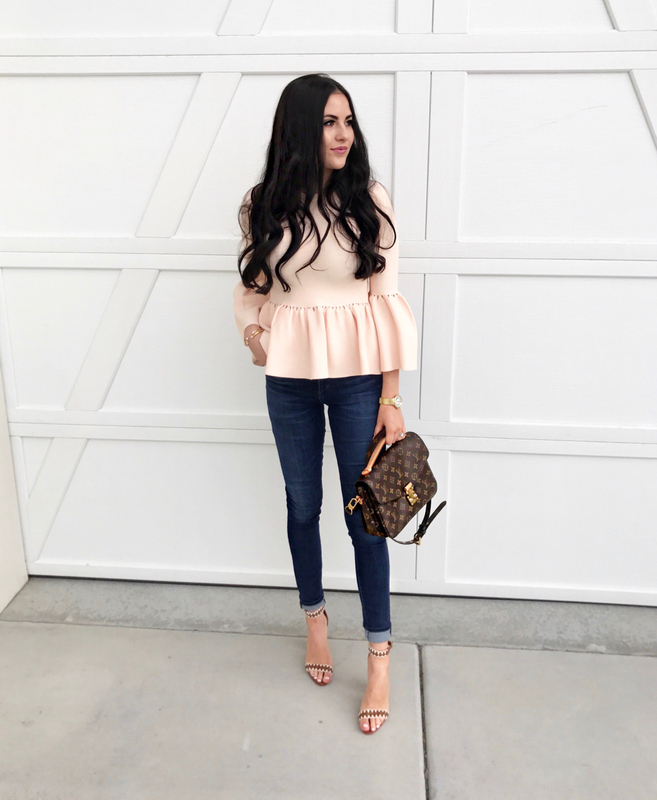 Love all your beautiful tops with ruffles and bell sleeves! All such gorgeous outfits, so much pink sprinkled in here it makes me smile. Have the best weekend! Love that Jonathan Simkhai top! I love every single look! I can’t seem to stop wearing that pink blush color either! I love how chic & feminine your style is! What size LV Neverfull is pictured above? is it the MM? All of the outfits are simply amazing! You have such a great style! I’ve been trying to find that striped dress you and your sister Emily were wearing during your visit to Disneyland. Do you happen to know the name of the dress on the ASOS website? Thanks so much! Let me see if I can find the name of the dresses. J.Crew has some similar striped dresses that I love!! Here are the links to those: 1, 2, 3, 4. The color of that first top is just the perfect peach!! 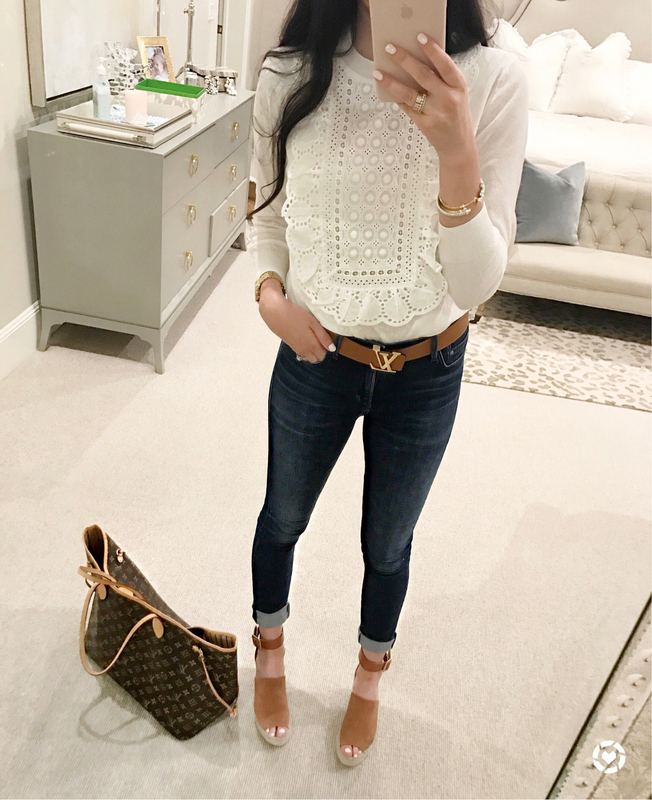 Those Elizabeth & James tops are my favorite! I think I need one in every color! I love these little round ups to see what you’ve been wearing! The last outfit is so glam I love it. Love these looks pretty lady!!! Those pink mules are perfect! Love that first outfit Rachel, that peachy coloured top is stunning! 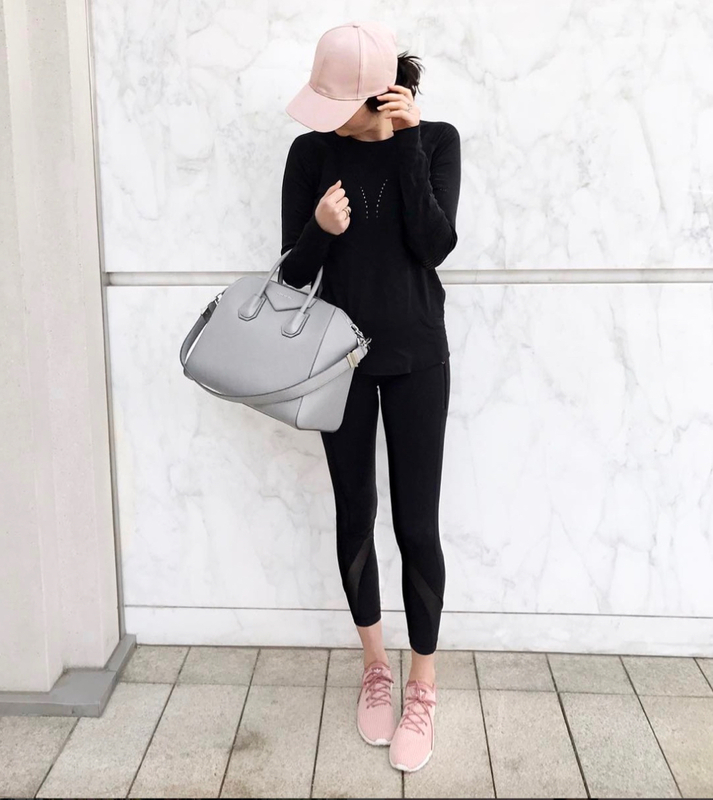 Love the activewear look too – the black looks so good with the blush. I need a blush cap like that in my life! I’m definitely loving these outfits! I really like how there’s a touch of pink in most of these outfits! I love the last outfit, those blush tones are amazing! Loving all the different pinks! So much cuteness! Love all of your fun sleeves!! Love the looks girl. Thanks for sharing! Would love to collaborate sometime? Absolutely love the pink Addidas shoes!! Im in love with your style, Rach! I can’t pick a favorite look, you’re always so chic and gorgeous! 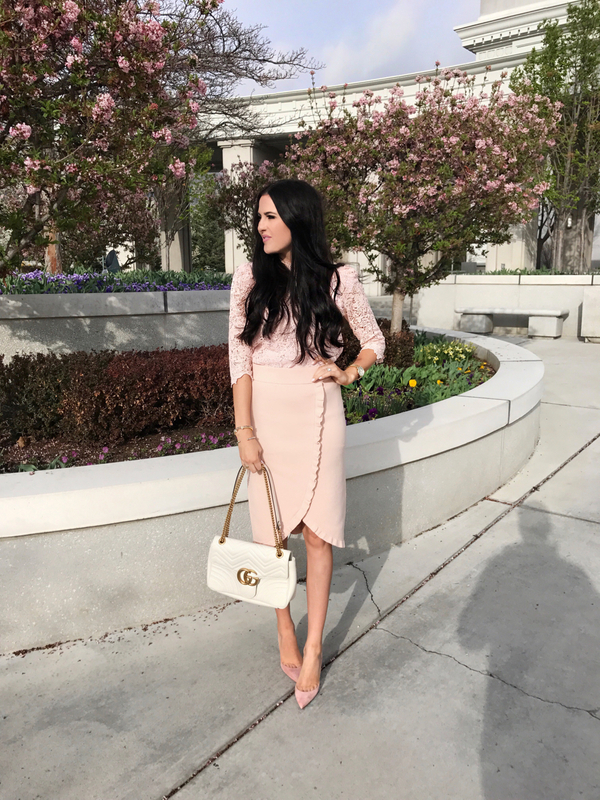 Blush and black is such a lovely combo! I am obsessed with your pink adidas. What is the exact style name!? THANK YOU!